The Bees “Dream Team” Package gives Youth Leagues or Teams the opportunity to enjoy a Bees game at New Britain Stadium. Each league or team participant will also have the once-in-a-lifetime experience of sharing the field with Bees players prior to the game. Highlights of this package also include block seating for your group, and a video board welcome message. This outing is available for groups of 25 or more, and tickets start as low as $5 per person. 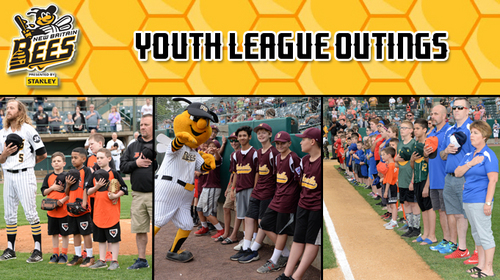 For more information about booking a “Dream Team” outing for your Youth League or Team, call the Bees Ticket Office at 860-826-BEES, or email tickets@nbbees.com.